It has been very busy since we got back from our vacation two weeks ago. We started our school year this week. I also gave the girls their first piano lessons. And the changes around the house and in our family mean that I can no longer count on having 60-90 minutes to myself in the afternoon. I'm hoping that will change as our new routine grows more familiar to us. In two of the other giveaways (Skirt Fixation and True Bias), I won a bunch of Art Gallery knits. These are destined for little boy Field Trip raglans and comfy baby pjs whenever I can find a minute to make them. In addition to my giveaway fabric haul, I have a few other pieces burning holes in my stash. Like this cozy rayon/cotton French terry, grabbed from Fabric Mart a few months ago. Three yards of this J. 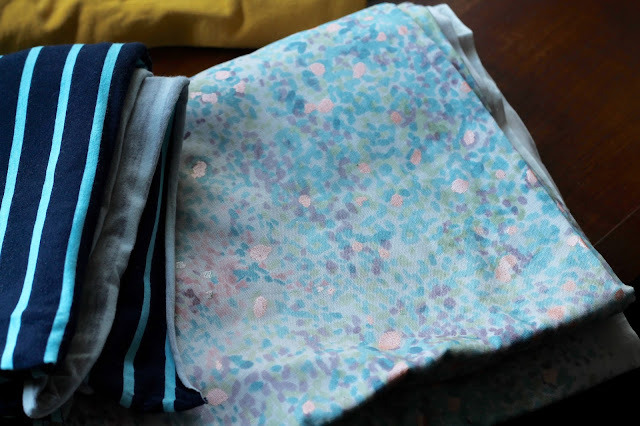 Crew cotton flannel voile (who knew there was such a thing? ), also from Fabric Mart. I usually wait to buy fabrics from that site until they are on sale (which never takes long as there is always at least 40% off going on a couple of categories of fabric at a time - part of the reason I love that site so much). But I actually bought this one at full price because there wasn't much in stock and I was afraid it would sell out. I am imagining it made up in a simultaneously floaty and cozy Late Lunch Tunic. Bought last winter with an Etsy gift card that I got for Christmas, this whimsical Lillestoff print. I had intended to make baby clothes out of it before Niko was born but I never got around to it. Now I would like to make a pair of Reversible Bubble Pants from Growing Up Sew Liberated and a Lullaby Layette jacket. Finally, there is this gorgeous piece of silk dupioni - 1.5 intact yards found at a thrift store for ... wait for it ... 99 cents. I have no idea what to do with it. Girls' dress? Skirt for me? Top for me? In all likelihood I'll just stare at it for years. But I would much rather sew it up. Any ideas? Congrats on all the wins! That is awesome. I think a skirt could be really cute out of that last fabric. I keep checking my local thrift shops and haven't found anything yet, but scraps. I will keep searching though. You just never know! I know, I couldn't believe my luck! Thanks for the comment! Wow, good stuff! I have to tell you that (sadly) I am super disappointed in my riley blake striped knit - well more of the red-grey than the yellow-grey. the red-grey has faded terribly and pilled as well. it looks like what you would expect from a cheap knit. so disappointing.